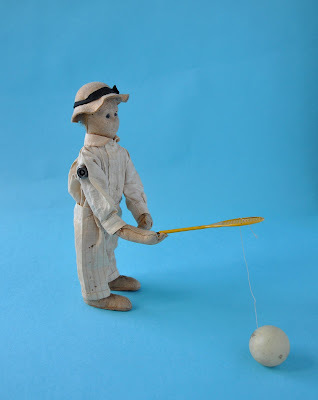 My latest purchase from eBay, a rare Bing tennis player. I have only seen one pair of these before in a Christie's auction in the late 1980s. This one is not in the best of condition, but he is all original. One eye is broken, they are tiny blue and black glass ones, if anyone knows where I can find a replacement, let me know. The clockwork mechanism is in the right shoulder and makes the tennis racket arm move up and down. The head and hands are covered in felt and he has his original cotton tennis whites. He dates from around 1910.. he was £19.50 and came with a Bing porter who is missing his barrow. Not a bad find? Tell me about you best eBay finds..